Our public spaces are dominated by functional objects. Stiff, neutral and dreary, they are part of an unremarkable decorative backdrop dedicated to a single and unchanging purpose. For many users, they contribute to creating spaces that Marc Augé refers to as ‘non-spaces’ in his famous work ‘Non Spaces: Introduction to the Anthropology of Supermodernity’, 1992. These spaces are interchangeable and anonymous discouraging exchanges or encounters. They are completely uninhabitable. The non-space par excellence is waiting areas for public transport. However, it is possible to imagine other uses for these necessary public spaces to incite emotions other than loneliness and boredom. This is the aim of a programme whose apparent utopian ideas conceal a genuine desire to radically transform the urban spaces we share. The Osmose Project. Osmose is a programme launched by the RAPT (Parisian Public Transport Authority) to progressively transform bus and metro stations. 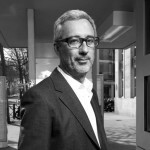 It is part of a wider European project, European Bus System of the Future (EBSF), which brings together 47 partners around the central idea that, ‘transport spaces are not only for transport’ (Yo Kaminagai, design representative for ‘Spaces’ department of the RATP). The station ceases to be a waiting space, a non-space, instead generating energy, welcoming users and sharing city resources. It becomes a kind of market place. A place where people meet and functions mix to help enhance public life. Waiting at a station can be a pleasant experience when the user is free to move through open interconnected spaces where new services are offered rather than being imposed. It is possible to rest, use administrative services and discover new sensations with diverse materials, lighting and sounds. In terms of sustainable development, the station of future needs to face the challenge of ever increasing urban density. The station could also have additional uses such as providing electricity for portable devices. Equally, the station should open up to the surrounding area by offering services to inhabitants rather than being focused on a single dreary purpose. These redesigned aspects would help make the time spent in transport enjoyable rather than simply tolerated. In several European capitals the EBSF project is above all a space to reflect on different uses related to public transport. However, numerous concrete projects for utopian constructions have also been unveiled and are on their way to becoming a reality. 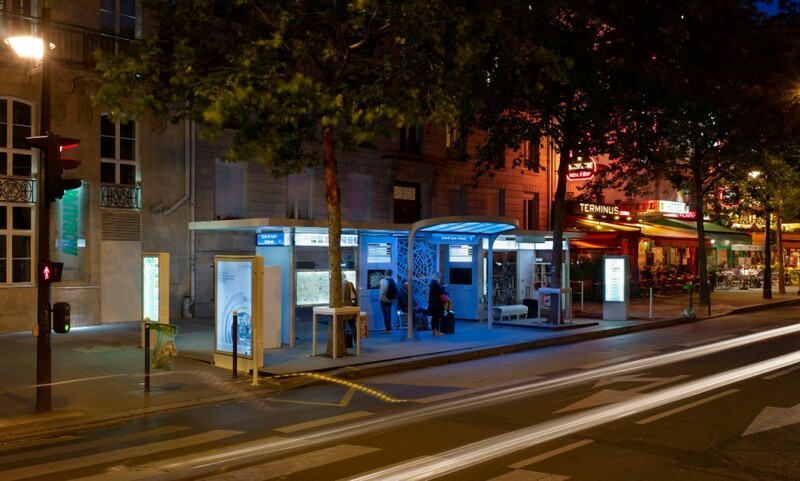 In France, the Osmose bus stop was a unique experiment. The Osmose bus stop, part of the Osmose programme launched by the RATP in 2009, was designed by Marc Aurel. It was an experimental space open to users for six months from May 2012 on Paris’ Boulevard Diderot. The station was ‘enhanced’ to move beyond its original function and offer additional services to the local inhabitants. The choice of location wasn’t arbitrary. The stop is at the crossroads between several day and night bus lines carrying 15,000 passengers every day. The first thing that was ‘enhanced’ was the size. The stop comprised 85 m² of flooring including 35 m² of covered space, instead of the standard 6 m². The space provided passengers with lots of information via touch screens including the latest bus news, but also information about the area (cultural events, services offered, small ads etc). There were numerous services offered including a self-service library, mirror, sockets, wifi, snack area and electric bicycles. The design was totally rethought to increase passenger comfort (heating in winter and numerous comfortable seats) and pleasure (changing sound and lighting, concave form, open space with partitions and largely transparent). ‘This multi-service station offer a concentrated dose of the elements we’d like to test with passengers’, as today the comfort in classic stations ‘is not at the level that it should be.’ (Yo Kaminagai). Today, the Osmose station is still visible on Boulevard Diderot, even if some of more experimental services are no longer offered. This pilot project remains bus stop of tomorrow, corresponding to design that the RAPT would like to extend to the Grand Paris. It won several prizes, such as the Judge’s Award from the Observeur du Design 13 in November 2012, the Janus for Prospective Design in 2013 from the French Design Institute judges and the Design Award at the UITP International Awards, on 26th May. Given this huge success, the RATP and the Paris city council decided to extend the project and keep the station in use.